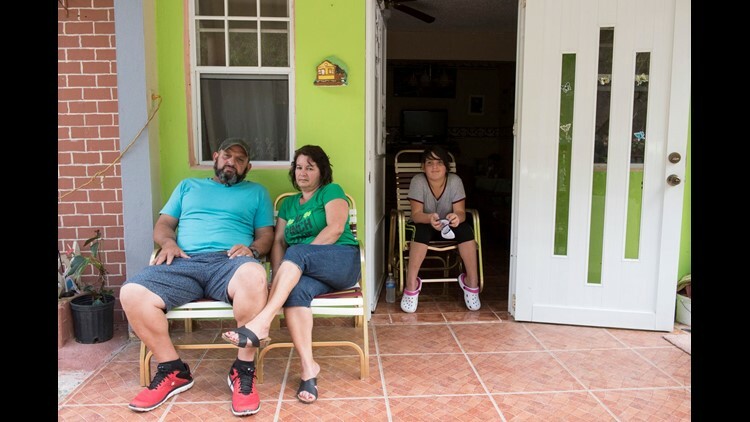 Angel Luis Vazquez with his wife, Marta Colón de Jesús, and daughter, Coral, is seen on in this Oct. 3, 2017 file photo in front of their home in Orocovis, Puerto Rico. The stories of survival I’ve witnessed in Puerto Rico during four reporting trips to the island over the past year have been plentiful and uplifting. But it's the stories of loss that stick with you the most. 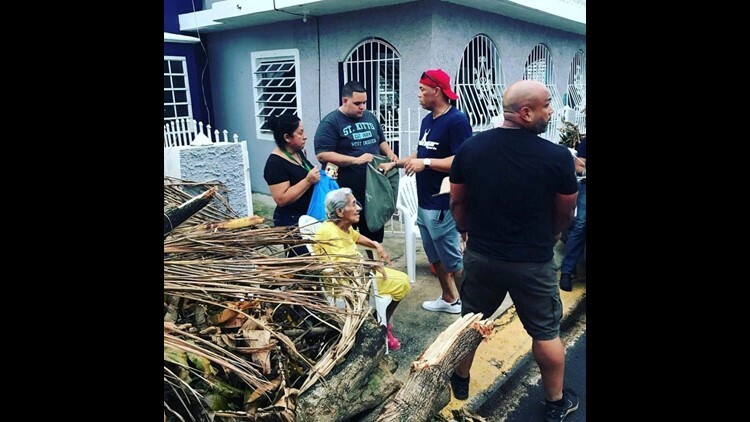 There's Angel Luis Vazquez, whose 82-year-old father-in-law died in his living room outside Orocovis as Hurricane Maria descended on them. It took three days to remove the body from the home because the roads were covered in debris. Rescue workers couldn't get in and Vazquez couldn't get out. Or the students at Jose Campeche High School in southeastern Puerto Rico, who lost family members during the storm. Or Sandra Rodriguez, a journalist from Bayamon, who lost 15 close friends and relatives in the wake of the storm, including her best friend. President Donald Trump’s comments Thursday questioning the official count of 2,975 deaths from Maria drew quick condemnation from Washington and across the USA. On the island, the words struck like hot daggers. "It's like punching us in the face," Rodriguez told me in a phone interview Friday from San Juan. "You have no idea how bad they are feeling about that in Puerto Rico. It brings a lot of sadness to our collective hearts." Over the past year, I've visited all corners of Puerto Rico – from the coastal cities of Humacao and Arecibo to the mountain hamlets of Orocovis and Adjuntas – chronicling the island's efforts to emerge from the destruction of Hurricane Maria. The Category 4 storm struck a year ago, causing widespread damage and paralyzing the island's power grid and infrastructure. Homes and other buildings destroyed by Hurricane Maria lie in ruins in Toa Alta, Puerto Rico, on Sept. 28, 2017. I met people who sat in dark homes for months and captured drinking water from nearby streams, sparking leptospirosis outbreaks. I interviewed survivors grappling with crushing depression, such as Magdaliz Medina of Morovis, whose hopelessness was so suffocating she would sit in her living room each night and cry. I heard stories of people who died high in the mountains of central Puerto Rico when there was no power and nowhere to plug in dialysis machines or ventilators, and of overwhelmed morgues that took months to return bodies to families. Through it all, the low official death count – 64 until last month – remained a thorn in the side of Puerto Ricans. Many knew it was much, much higher. 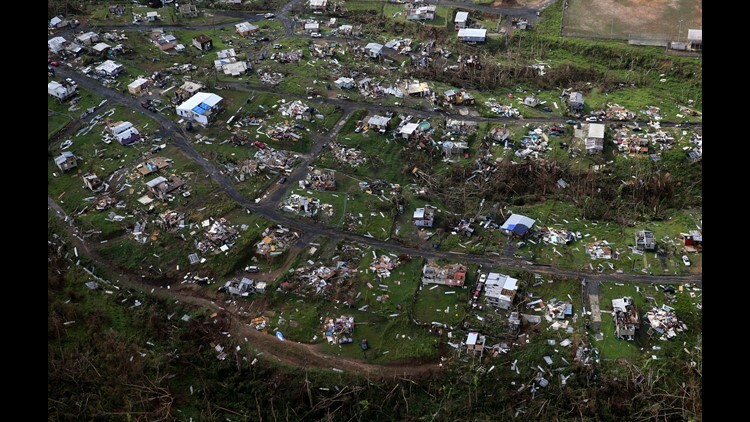 Despite studies by The New York Times and Harvard University estimating the death toll in the thousands, the government of Puerto Rico stuck to the double-digit number until researchers at George Washington University's Milken Institute School of Public Health in Washington completed their study in August. GWU's revised estimate of 2,975 gave Maria the unsavory title of second-deadliest hurricane in U.S. history, behind only the Galveston hurricane of 1900, which killed more than 6,000. Many Puerto Ricans say Maria's death toll is even higher. Hall of Famer Roberto Alomar visits his hometown of Salinas in Puerto Rico, in this 2017 file photo, handing out water, food and t-shirts to help relief efforts caused by the destruction of Hurricane Maria. Rodriguez said her friend Eileen Jordan died of a sudden heart attack in October. She was stressed and overburdened by the slow recovery, the lack of power and the coast-to-coast destruction of the island delivered by Maria, Rodriguez said. Jordan was 43 and left behind a 14-year-old daughter. The morgue where she was taken was so backed up with bodies that Jordan's remains weren't returned to her family until December. Her body by then was so decomposed, the family had no choice but to cremate her. Rodriguez, a radio journalist, said she's heard similar stories in her travels around the island. Lack of power and supplies and the overall stress of an island in shambles claimed innumerable lives, she said. "If you go and ask the doctors and hospitals, where a lot of the patients died, a lot of people just kept dying – four, five months after the storm," she said. Those who survived faced widespread destruction, post-traumatic stress disorder and an uneven state and federal response. But Trump's tweets stung the most, Rodriguez told me. "To hear the president of the United States – such a strong and decent nation that it's been in the world – disregard the lives of American citizens, it's just unbelievable," she said. "It's inhumane." 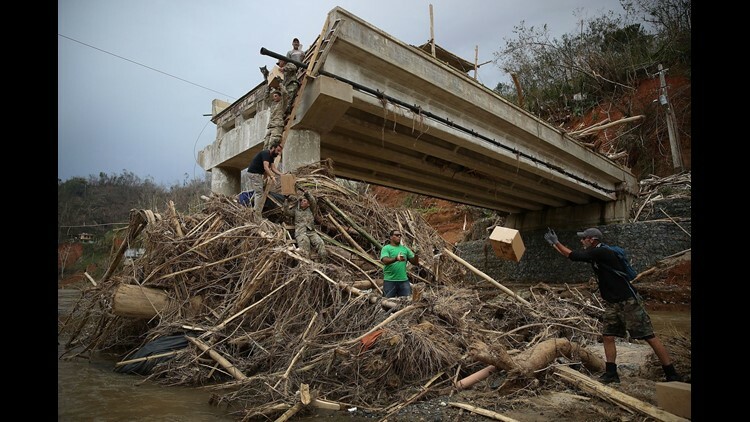 Members of the U.S. Army 1st Special Forces Command and volunteers deliver boxes of M.R.E's and water up a makeshift ladder to people that were cut off after the bridge collapsed in the wake of the devastation left across the island by Hurricane Maria on Oct.5, 2017 in Utuado, Puerto Rico. The neighborhood was cut off from help for about two weeks and there is still a need for basic life necessities after the Category 4 hurricane passed through.